Trio US formé des soeurs Andrews: LaVerne (née le 6 Juillet 1911, décédée le 8 Mai 1967), Maxene (née le 3 Janvier 1916, décédée le 21 Octobre 1995), et Patti (née le 16 Février 1918, décédée le 30 Janvier 2013). Originaire de Minneapolis, les "Andrews Sisters" débutèrent en 1930, encore écolières. Elles sont découvertes à New York dans une émission de radio par Dave Kapp de chez Decca Records. Les Soeurs Andrews ont vendu près de 50 millions de disques et ont tourné dans 17 films. Elles se sont séparées en 1975. The Andrews Sisters were the most successful female Vocals group of the first half of the 20th century in the U.S. One source lists 113 singles chart entries by the trio between 1938-1951, an average of more than eight per year. They boasted an exuberant, close-harmony style well-suited to cheery novelty songs, and their intricate Vocals arrangements and rhythmic ability mirrored the sound of the swing bands that constituted their chief competition in their heyday. But, in a sense, they had no competition. No other female Vocals group, and very few male ones, came close to their success from the late '30s to the early '50s, an era when first big bands and then solo singers dominated popular music. Their reign is all the more remarkable given that they swam against the current of contemporary music trends while making it seem effortless. For the most part, the Andrews Sisters did not focus on romantic material, but rather sang upbeat songs, often borrowed from other cultures. Although they were well-established by the time the U.S. entered World War II, their optimistic tenor made them perfect boosters of the war effort, and in later years they remained closely identified with the war years, remembered as wearing military uniforms and singing their signature song, "Boogie Woogie Bugle Boy.". The Andrews Sisters — LaVerne Andrews (born July 6, 1911; died May 8, 1967), Maxene Andrews (born January 3, 1916; died October 21, 1995), and Patty Andrews (born February 16, 1918) — were each born in Mound, MN, the children of a Greek immigrant father and a Norwegian immigrant mother who ran a restaurant in Minneapolis. They turned to singing as children, entertaining on local radio and in amateur revues, with Patty taking the lead, Maxene singing high harmony, and LaVerne low. They were particularly inspired by the Boswell Sisters, who scored a number of hits in the early '30s. Their first professional engagement came in December 1932 at the Orpheum Theatre in Minneapolis. In November 1933, they joined a vaudeville troupe for six months, traveling around the Midwest. Afterwards, their parents closed the restaurant to devote themselves to their career, and they spent the years 1934-1937 touring with bands. In 1937, they went to New York as part of Leon Belasco's band and while there made their first recordings, albeit under Belasco's name, for Brunswick Records. After the Belasco band broke up that summer, they were signed to Decca Records on their own. Decca had recorded the Boswell Sisters successfully until they broke up in 1935, and the label was on the lookout for a similar group. 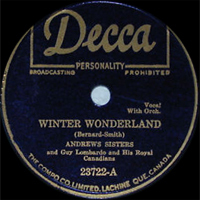 The Andrews Sisters' second Decca single, "Bei Mir Bist Du Schoen," an Anglicized version of a song from the Yiddish theater, became a massive hit. The song made its first appearance on Your Hit Parade on January 8, 1938, and rose to number one two weeks later. The hit established the trio, which began to get extensive radio and personal-appearance work. They returned to the hit parade in April 1939 with their recording of the novelty song "Hold Tight, Hold Tight." In 1940, signed to Universal Pictures, they made the first of a series of low-budget "B" movies, Argentine Nights. (Between 1940-1948, they appeared in 17 films, including lending their voices to two animated features for Disney.) That year, they scored a Top Ten hit on the Billboard chart with "Ferryboat Serenade (La Piccinina)." "I'll Be With You in Apple Blossom Time," their Top Ten hit of 1941, was featured in their film Buck Privates. Also during the year, they reached the Top 20 with "Boogie Woogie Bugle Boy." With the U.S. entry into World War II, the Andrews Sisters began appearing frequently at military bases; they later traveled overseas to entertain the troops. Although their recording activity was slowed by the musicians' union strike that began in 1942, they had another Top Ten hit that year with "Strip Polka." When Decca settled with the union in 1943, they embarked on a series of hits, many of them with Bing Crosby. The million-selling "Pistol Packin' Mama," backed with "Vict'ry Polka," was a two-sided hit with Crosby in 1943-1944, then they topped the charts with their own "Shoo-Shoo Baby" in January 1944. Before the end of the year, they and Crosby had gone to number one with the double-sided hit "(There'll Be A) Hot Time in the Town of Berlin (When the Yanks Go Marching In)" and "Is You Is or Is You Ain't (Ma' Baby)," as well as Cole Porter's "Don't Fence Me In." 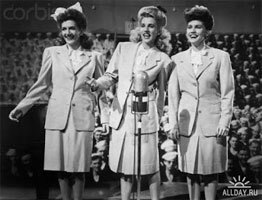 The Andrews Sisters premiered their own weekly network radio show, Eight-to-the-Bar Ranch, at the end of 1944 as the hits continued with the calypso song "Rum and Coca-Cola," which went to number one in February 1945, becoming the biggest hit of that year. The group's other Top Ten hits for 1945 were "Ac-Cent-Tchu-Ate the Positive" and "Along the Navajo Trail," both with Crosby, and "The Blond Sailor." 1946 found them in the Top Ten with the gold-selling "South America, Take It Away" (with Crosby), "Rumors Are Flying" (accompanied by guitarist Les Paul), and "Christmas Island" (backed by Guy Lombardo & His Royal Canadians). 1947 brought the Top Ten hits "Tallahassee" (with Crosby), "Near You," and "The Lady From 29 Palms." And in 1948, when they were ranked as the top recording artists of the year, the Andrews Sisters reached the Top Ten with "Civilization (Bongo, Bongo, Bongo)" (with Danny Kaye), "Toolie Oolie Doolie (The Yodel Polka)," "Underneath the Arches," and "You Call Everybody Darling." The Andrews Sisters cooled as a recording act after 1948, as they began to focus on nightclub performing and Patty Andrews became more of a focus of the group as well as launching a concurrent solo recording career. Their next big hit was "I Can Dream, Can't I?," a gold single on which Patty sang lead with her sisters providing backup; it hit number one in January 1950. "I Wanna Be Loved," with the same sort of arrangement, also topped the charts in June. The trio's last Top Ten hit was "Sparrow in the Tree Top," another pairing with Bing Crosby, in 1951. 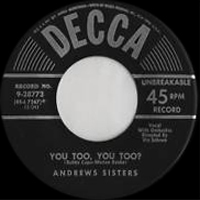 They continued to record for Decca through the end of 1953, at which point Patty Andrews left the group for a solo career while Maxene and LaVerne Andrews continued to perform as the Andrews Sisters. In June 1956, the three reconciled. They recorded for Capitol Records (1956-1959) and Dot Records (1961-1967) without commercial impact. In the fall of 1966, LaVerne Andrews retired from performing due to illness and was replaced by Joyce de Young; she died of cancer the following spring. The Andrews Sisters made their final appearance as a trio in July 1968, after which Maxene Andrews took a job at Lake Tahoe Paradise College of Fine Arts. Patty Andrews returned to her solo career and in 1971 appeared in a musical revue called Victory Canteen in Los Angeles. The revue was then expanded into a book musical and Maxene Andrews was brought in for what became Over Here!. Meanwhile, Bette Midler revived "Boogie Woogie Bugle Boy" for a Top Ten hit in 1973, bringing two Andrews Sisters compilation albums (The Best of the Andrews Sisters on MCA and Boogie Woogie Bugle Girls on Paramount) into the charts. Over Here! opened on Broadway on March 6, 1974. Its cast album charted, as did another Andrews Sisters compilation (In the Mood on Paramount). Maxene and Patty Andrews had a falling out with the producers of Over Here!, and with each other, leading to the show's premature closing on January 4, 1975, and the cancellation of a national tour. The two sisters remained estranged from then on, although they made occasional joint appearances and Patty visited the hospital when Maxene suffered a heart attack in 1982. Both sisters maintained solo careers into the 1990s. Maxene Andrews was on a vacation from her role in the off-Broadway musical Swingtime Canteen when she suffered another heart attack and died in the fall of 1995. 1938 78 t. DECCA 1703 (US) . Ti Pi Tin / Where Have We Met Before? 1938 78 t. DECCA 1744 (US) . Shortenin' Bread / Ooooh Boom! 1939 78 t. DECCA 2462 (US) . Beer Barrel Polka / Well, All Right! 1946 78 t. DECCA 23605 (US) . Bei Mir Bist Du Schon / Joseph! Joseph! 1946 78 t. DECCA 23606 (US) . Hold Tight, Hold Tight / Well All Right! 1951 78 t. DECCA 27757 (US) . ANDREWS SISTERS / Vic SCHOEN - Carioca / ? 1951 SP DECCA 9-27757 (US) . ANDREWS SISTERS / Vic SCHOEN - Carioca / ? 1951 78 t. DECCA 27878 (US) . The Blond Sailor / ? 1951 SP DECCA 9-27878 (US) . The Blond Sailor / ? 1953 78 t. DECCA 28773 (US) . Tegucigalpa / You Too,You Too? 1953 SP DECCA 9-28773 (US) . Tegucigalpa / You Too,You Too? 1974 LP 12" COLUMBIA 32961 (US) THE ANDREWS SISTERS IN OVER HERE ! 10/1990 CD MCA 42044 (US) 50TH ANNIVERSARY COLLECTION - Bei Mir Bist Du Schön / Gimme Some Skin, My Friend / Beat Me Daddy, Eight To The Bar / Tuxedo Junction / Bounce Me Brother With A Solid Four / Pagan Love Song / Shoo Shoo Baby / Boogie Woogie Bugle Boy / Rhumboogie / Beer Barrel Polka (Roll Out The Barrel) / Don't Sit Under The Apple Tree (With Anyone Else But Me) / Rum And Coca-Cola / (I'm Getting) Corns For My Country / Civilization (Bongo, Bongo, Bongo) / 'Way Down Yonder In New Orleans / I Can Dream, Can't I? 1990 CD MCA 4024 (US) THE BEST OF THE ANDREWS SISTERS - Bei Mir Bist Du Schön / Beer Barrel Polka / Sonny Boy / Rum And Coca-Cola / Don't Sit Under The Apple Tree (With Anyone Else But Me) / Tico-Tico / Beat Me Daddy, Eight To The Bar / Joseph! Joseph! / I'll Be With You In Apple Blossom Time / Pennsylvania Polka / Strip Polka / I Can Dream, Can't I? / South American Way / Rhumboogie / Say "Si Si" (Para Vigo Me Voy) / Hold Tight (Want Some Sea Food, Mama) / I Wanna Be Loved / There Will Never Be Another You / Boogie Woogie Bugle Boy / Yes, My Darling Daughter / Ti-Pi-Tin / Oh! Ma-Ma! (The Butcher Boy) / Well All Right (Tonight's The Night) / Oh Johnny, Oh Johnny, Oh! CD 1 : Bei Mir Bist Du Schön / Ti-Pi-Tin / Shortnin' Bread / Hold Tight (Want Some Sea Food, Mama) / Beer Barrel Polka (Roll Out The Barrel) / Well All Right (Tonight's The Night) / Oh Johnny, Oh Johnny, Oh! / Say "Si Si" (Para Vigo Me Voy) / Ferryboat Serenade / Beat Me Daddy, Eight To The Bar / Boogie Woogie Bugle Boy / I'll Be With You In Apple Blossom Time / Aurora / Jealous / Shrine Of St. Cecilia / Don't Sit Under The Apple Tree (With Anyone Else But Me) / Pennsylvania Polka / Pistol Packin' Mama / Shoo Shoo Baby / Tico-Tico / (There'll Be A) Hot Time In The Town Of Berlin (When The Yanks Go March / Is You Is Or Is You Ain't My Baby? CD 1 : Ciribiribin / Yodelin' Jive / Pistol Packin' Mama / Vict'ry Polka / Jingle Bells / Santa Claus Is Coming to Town / (There'll Be A) Hot Time In The Town Of Berlin (When The Yanks Go March ) / Is You Is Or Is You Ain't My Baby? / Don't Fence Me In / 10. Three Caballeros / There's a Fella Waitin' in Poughkeepsie / Ac-Cent-Tchu-Ate The Positive / Along The Navajo Trail / Good, Good, Good / Happy, Happy, Happy Wedding Day / Betsy / Route 66 / South America, Take It Away! / Anything You Can Do / There's No Business Like Show Business / Go West, Young Man / Tallahassee / Freedom Train / Apalachicola, Fla / You Don't Have To Know The Language / Hundred And Sixty Acres / At the Flying "W"
01/1999 CD ENTERTAINERS 255 (US) IMMORTAL HITS - Bei Mir Bist Du Schön / Rum And Coca-Cola / Straighten Up And Fly Right / Sing, Sing, Sing / The Mambo Man / Hold Tight (Want Some Sea Food, Mama) / Down By The Ohio / In The Mood / The Woodpecker Song / Beer Barrel Polka / Daddy / Elmer's Tune / Don't Be That Way / Lullaby Of Broadway / If I Had A Boy Like You / House Of Blue Lights / Say "Si Si" (Para Vigo Me Voy) / South American Way / Oh! Ma-Ma! (The Butcher Boy) / Rhumboogie / Tico-Tico / Beat Me Daddy, Eight To The Bar / Joseph! Joseph! / Ti-Pi-Tin / Boogie Woogie Bugle Boy / Sonny Boy / Oh Johnny, Oh Johnny, Oh! 03/2000 CD GOING FOR A SONG 285 (UK) GREATEST HITS - Boogie Woogie Bugle Boy / Don't Sit Under The Apple Tree (With Anyone Else But Me) / Rum & Coca Cola / Beat Me Daddy Eight To The Bar / Beer Barrel Polka / Bei Mir Bist Du Schon / Near You / Rumors Are Flying / Bounce Me Brother With A Solid Four / Gimme Some Skin, My Friend / Ac-Cent-Tchu-Ate The Positive / Rhumboogie / Straighten Up And Fly Right / Shoo, Shoo, Baby / Money Is The Root Of All Evil / I Can Dream, Can't I? 03/2000 CD MCA 112230 (US) THE BEST OF ANDREWS SISTERS - Bei Mir Bist Du Schön / Hold Tight (Want Some Sea Food, Mama) / Beat Me Daddy, Eight To The Bar / I'll Be With You In Apple Blossom Time / Boogie Woogie Bugle Boy / Don't Sit Under The Apple Tree (With Anyone Else But Me) / Shoo Shoo Baby / Rum And Coca-Cola / Near You / I Wanna Be Loved / Ac-Cent-Tchu-Ate The Positive / I Can Dream, Can't I? 03/2001 CD PAST PERFECT 4322 (UK) BEI MIR BIST DU SCHÖN - Bei Mir Bist Du Schön / Beer Barrel Polka / Boogie Woogie Bugle Boy / Beat Me Daddy, Eight To The Bar / Near You / Rumors Are Flying / Bounce Me Brother With A Solid Four / Don't Sit Under The Apple Tree (With Anyone Else But Me) / Gimme Some Skin, My Friend / Ac-Cent-Tchu-Ate The Positive / Rhumboogie / Money Is The Root Of All Evil / Straighten Up And Fly Right / Shoo Shoo Baby / Rum And Coca-Cola / I Can Dream, Can't I? CD 2 : There's No Business Like Show Business / You Call Everybody Darling / Pistol Packin' Mama / The Old Piano Roll Blues / I See, I See / Let A Smile Be Your Umbrella / Hit The Road / Strip Polka / Why Talk About Love? / Yodelin' Jive / Anything You Can Do / The Matador / Near You / Sha-Sha / Just A Simple Melody / The Jumpin' Jive (Jim-Jam-Jump) / Says My Heart / Lullaby To A Little Jitterbug / Well All Right (Tonight's The Night) / Begin The Beguine / Elmer's Tune / Down By The Ohio / There's A Fella Waitin' In Poughkeepsie / Along The Navajo Trail / I Wanna Be Loved / I Can Dream, Can't I? 10/2002 CD DUTTON LABORATORIES / VOCALION 5016 (US) AMERICA'S SWEETHEARTS - Boogie Woogie Bugle Boy / Ac-Cent-Tchu-Ate The Positive / Hold Tight (Want Some Sea Food, Mama) / I'll Be With You In Apple Blossom Time / Shoo-Shoo Baby / Don't Sit Under The Apple Tree (With Anyone Else But Me) / I Wanna Be Loved / Straighten Up And Fly Right / Rum And Coca-Cola / Near You / Beat Me Daddy, Eight To The Bar / Tuxedo Junction / Sleepy Serenade / Is You Is Or Is You Ain't MyBaby? / I Can Dream, Can't I? CD 3 : Tuxedo Junction / Lily Belle / Tica-Ti, Tica-Ta / A Zoot Suit (For My Sunday Gal) / You're A Lucky Fellow, Mr. Smith' / Stars Are The Windows Of Heaven / Parade Of The Wooden Soldiers / Jing-A-Ling, Jing-A-Ling / Rancho Pillow / Hohokus, N.J. / Beatin', Bangin', 'n Scratchin' / Jack Of All Trades / Atlanta, G.A. / Coax Me A Little Bit / There'll Be A Jubilee / Put 'Em In A Box, Tie 'Em With A Ribbon / Avocado / I'm Gonna Paper My Walls With Your Love Letters / I've Just Got To Get Out Of The Habit / Yipsee-I-O / Underneath The Linden Tree / I Didn't Know The Gun Was Loaded / Hurry! Hurry! Hurry! / Pack Up Your Troubles / How Many Times? 06/2003 CD COLUMBIA RIVER 180211 (US) JUKEBOX MEMORIES - Boogie Woogie Bugle Boy / Don't Sit Under The Apple Tree (With Anyone Else But Me) / Rum And Coca-Cola / Sonny Boy / Shoo Shoo Baby / Bei Mir Bist Du Schön / I Can Dream, Can't I? / Ti-Pi-Tin / The Beer Barrel Polka / Oh Johnny, Oh Johnny, Oh! 02/2006 CD AIR ? (UK) THE ANDREWS SISTERS GREATEST HITS - Boogie Woogie Bugle Boy / Don't Sit Under The Apple Tree (With Anyone Else But Me) / Rum & Coca Cola / Beat Me Daddy Eight To The Bar / Beer Barrel Polka / Bei Mir Bist Du Schon / Near You / Rumors Are Flying / Bounce Me Brother With A Solid Four / Gimme Some Skin, My Friend / Ac-Cent-Tchu-Ate The Positive (With Bing CROSBY) / Rhumboogie / Straighten Up And Fly Right / Shoo, Shoo, Baby / Money Is The Root Of All Evil / I Can Dream, Can't I?